What weights and capacities do I need to know? How do I determine my vehicle's towing capacity? How do I weigh my trailer? How do I measure tongue weight? Is there a proper way to load my trailer? Before you hook up a trailer or even purchase a trailer hitch, you should first consider towing capacity. How much weight is your vehicle rated to tow? How much does your trailer weigh? In this chapter, we will discuss the terminology and acronyms used to describe vehicle and trailer towing capacity, how to find the towing capacity of your vehicle and how to measure some of the crucial weights involved with towing. Before we get into methods for determining weight and weight capacity, we need to go over some terms. The gross vehicle weight rating (GVWR) is the maximum loaded weight of your vehicle, as determined by the vehicle manufacturer. If you exceed this weight, the vehicle's engine, transmission, brakes and other systems may be loaded beyond their design limits. The gross axle weight rating (GAWR) is the maximum weight that can be placed on your front or rear axles. The vehicle manufacturer gives each axle its own rating. If you exceed these weight ratings, the vehicle components may be loaded beyond their design limits. The gross trailer weight (GTW) is the total weight of the trailer and its cargo. It can be determined by putting the fully loaded trailer on a vehicle scale. Tongue weight (TW) is the downward force exerted on the back of a tow vehicle by a trailer or towable load. The tongue weight is greatly affected by where cargo is positioned and is important for maintaining good control of the vehicle. Proper tongue weight should be about 10-15% of the GTW. The best means for determining your vehicle's towing capacity is to read your vehicle owner's manual. The owner's manual will provide detailed instructions and limitations, usually accompanied by tips for safe towing. If your owner's manual has been misplaced, most manufacturers provide free downloadable copies on their website. Towing Tip: In general, 2WD vehicles have a higher towing capacity than comparable AWD and 4WD vehicles. This is because 4WD models are several hundred pounds heavier than equivalent 2WD models, having a transfer case, extra drive shaft and extra axle. After familiarizing yourself with your vehicle's weight capacities and general towing capacity, it is time to look at trailer weight. Your trailer should have a VIN plate (Vehicle Identification Number), usually installed somewhere on the trailer frame. This plate not only carries the trailer's serial number, but it will also list the trailer's unloaded GTW, maximum GVWR and GAWR for each axle. 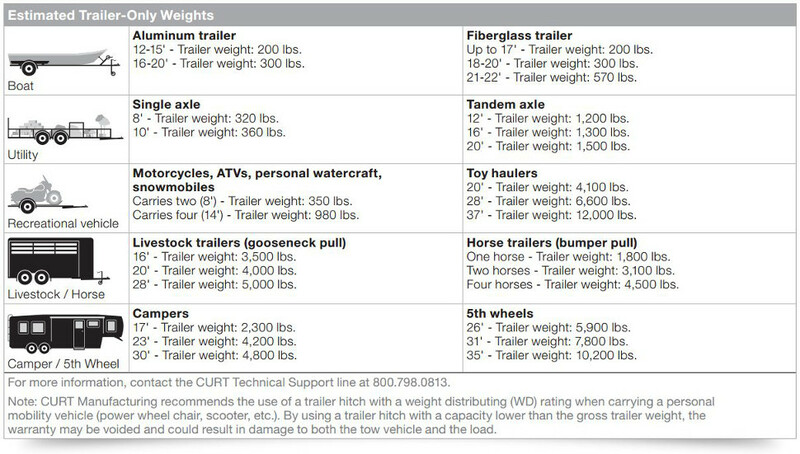 The table below shows representative weights for a number of common trailer styles. These weights may not reflect the weight of your own trailer. The only way to be sure of the gross trailer weight is to load the trailer as you expect to use it and weigh it on a vehicle scale. Such scales are sometimes available to recreational users at state highway weigh stations, refuse transfer stations and commercial truck stops. The advantage of using a vehicle scale is that you learn the actual weight of your loaded trailer. Be sure to call ahead and confirm that you are welcome to use these scales before driving over. The last weight you have to consider is your trailer's tongue weight. Tongue weight is the weight exerted at the vehicle-trailer coupling point when your trailer is fully loaded and hooked up for towing. In general, you want the tongue weight to be about 10-15% of the gross trailer weight. There are a few different methods that can be used for measuring tongue weight, and with each of them, always be sure that your trailer is parked on an even, level surface. - Available at most towing supply shops, a tongue weight scale is a small scale designed specifically to measure a trailer's tongue weight. Because you probably will not need to check your trailer's tongue weight very often, you can call and ask if your local trailer dealer has a tongue scale you can use. - You can also measure your trailer's tongue weight with a common bathroom scale. If the tongue weight is expected to be less than 300 lbs., simply place the tongue directly on the scale. If the weight is likely greater than 300 lbs., you can use some boards and pipes and set up a test as shown below. Using this setup, take a reading off the bathroom scale and triple it to find your actual tongue weight. One last method for measuring the tongue weight of your trailer is to use a vehicle scale at a rest stop or at your local trailer dealer. Begin by weighing your vehicle without the trailer hooked up. Then, hook up your trailer and weigh your vehicle again, without letting the wheels of the trailer touch the scale. Take the weight of your vehicle and subtract it from the weight of your vehicle with the trailer attached. The difference is the tongue weight of the trailer. After finding the tongue weight and comparing it to the gross trailer weight, you may realize you have too much or too little. Remember, an ideal tongue weight is 10-15% of the gross trailer weight. The best way to achieve proper tongue weight is by distributing the weight of your cargo. If you place more weight in front of the trailer axle, you will generate more tongue weight. If you place more weight behind the axle, the tongue weight will decrease. A good figure to follow is 60% in front and 40% behind, unless otherwise specified by the trailer manufacturer. 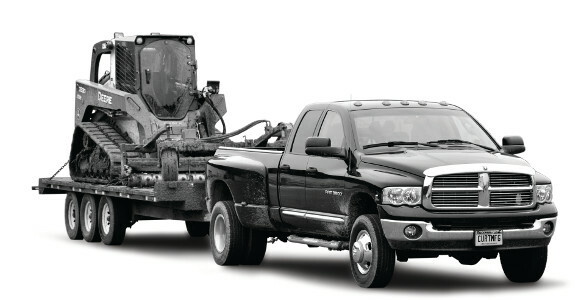 If you have too much tongue weight, your tow rig may not be as responsive as it should be. If you do not have enough tongue weight, your trailer may be more likely to sway. Always follow the tow vehicle and trailer manufacturer's instructions for tongue weight. Once you know the towing capacity of your vehicle and the weight of your trailer, it is time to select a hitch. In the next chapter, we will cover how to select the right hitch for your towing needs.